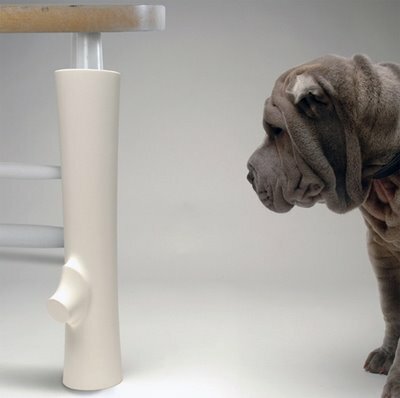 The White Dog Blog: Good Dog Design ... or not?? Ok, this one is either really, really clever, or really, really not. This "toy" is designed to protect your chair and table legs by covering them with something safer for your pup to chew on. We love the idea and we love the design. But, knowing how I operate, I am POSITIVE that I would get all excited and start chewing on an UNPROTECTED chair leg and think it was OK. As smart as I like to think I am, I am pretty sure this one has major dog house potential for me. Knowing some of you out there are way smarter than me (here's your chance, poodles!! ), I 'd like to know what you think ???? ?